Chronic pain is one of the most devastating of Fibromyalgia symptoms as well as of the other co-conditions such as CFS/ME/MCS. Osteoarthritis, auto immune illnesses and other conditions often accompany fibro as well. Progress in understanding pain mechanisms has been slow until recently. I work to stay up to date on fibromyalgia and pain research. Most studies I read leave my “hope dial" unmoved. Many are so abstract or focused on such minute details that we just can’t relate to them. I take for granted that they are needed and are providing basic knowledge useful in sorting out the mechanisms at work in the complexities of fibromyalgia. In recent years, I’ve been encouraged by work going on at the molecular level of our cells. Advances recently by several research groups worldwide have determined the mechanisms behind the pain. This work has really been enabled by tremendous advances in imaging. Study scientists are now able to look at the actual cellular level receptors that I talked about on the “Mind Body Science” page of this website. That view of even the shape of these molecular components tells the bench scientist information that puts studies on the fast track, saving weeks or even months of time. Additionally, because of a friend’s diagnosis of Stage 4 Renal cancer five years ago, I became interested in the “infant” attempts at treating cancer at the molecular level. I watched this effort for three years while my friend went through multiple surgeries and chemo treatments. Finally, his options were over except for a clinical trial for one of these emerging treatments. It worked! He’s cancer-free today after a prognosis four years ago of 2 to 3-months to live with one of the most aggressive forms of cancer. What’s my point? It is that once doctors could see into our bodies at a molecular level for not only the disease mechanisms, but also the treatment results, progress "took wings”. And, today there are multiple clinical trials taking place with this new approach; and many are achieving significant positive results. A “cure” for cancer is on many tongues in that medical community! Molecular level chronic pain research in my opinion is where molecular level cancer research was many years ago. It is true that funding for chronic pain associated with fibromyalgia and its accompanying conditions is much less than that for cancer research; but, there is hope there also. My first article under Fibromyalgia Research, “Cancer Study Provides Hope for Fibromyalgia Victims” brought out the fact that many cancer victims suffered from chemotherapy induced neuropathy. It is also the main pain mechanism in fibromyalgia. It is so debilitating that some cancer patients refuse further chemo treatment regardless of the mortality outcome. Tell that to your doubting friends and family who say “you don’t look sick” or “it’s all in your head”. The “hope” I refer to in that article is that with a “cure” for many types of cancer being within sight, the cancer researchers are not likely to stand for a situation where the “cure is worse than the disease”. Already, some of the enormous cancer research dollars (compared to fibromyalgia funding) are being applied to solving the chemo induced neuropathy. And, as I’m about to report, the pain mechanisms are the same as with fibromyalgia. What resolves the cancer issue will resolve the fibromyalgia chronic pain issue. For a peek at even newer, more futuristic research efforts that may apply to fibromyalgia as well as cancer check out two articles (#3 & #4) on the December 24, 2014 edition of Fierce Biotech's Daily Top Stories. Additionally, there have been recent breakthroughs by several non cancer, pain-focused research groups worldwide that explain the mechanisms behind the pain, especially chronic, neuropathic pain. A number of potential solutions are now in sight. Fibro-girl says “there is hope”. 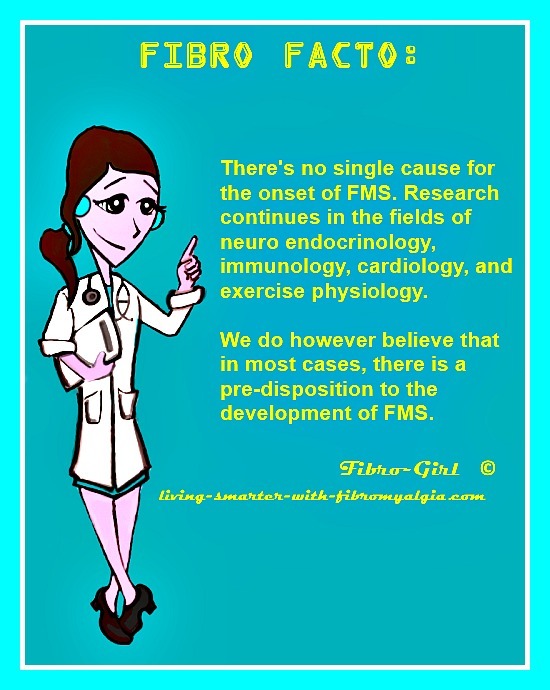 There is evidence that there is a pre-disposition to many cases of FMS. 1. A genetic predisposition. 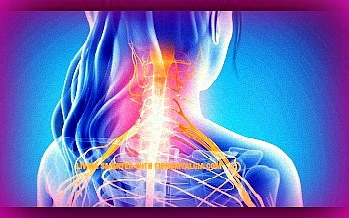 My “Fibro Factos” on my facebook page, facebook.com/FibroFitPeople, have long pointed out this predisposition. The adjacent image is an example. My article Mindbody Epigenetic Inheritance on this website discussed how we can inherit “markers” from our parents (or even grandparents) that mutate our genes thereby changing our cells functions. Traumas in their lives can actually play a role in our chronic pain. 2. Our own life experience. My page “Mind Body Science” goes into detail about how physical and emotional traumas in our lives can turn genes and cells “On or Off” and thereby affect pain pathways. I refer to this as “filtering” the results of chemical messages and electrical signals in the Central Nervous System (CNS) thereby leading to chronic pain. 3. Emotional attitude contributes much to our susceptibility to chronic pain. On my “Attitude Conditioning” page I admit I had to “fire” my “Negative Nelly” which had become a barrier to further improvement. Then, I had to consistently practice focusing on even small successes to remain positive no matter what. Improvement in my fibro pain then followed. Here, on my website, I point out that in each of these cases there are ways to “intentionally intervene” in order to lower our susceptibility and improve ALL our symptoms, not just chronic pain. Recent research has led to three approaches to eliminating chronic pain that show real promise in the near future. They each moved my “hope dial” a great deal. 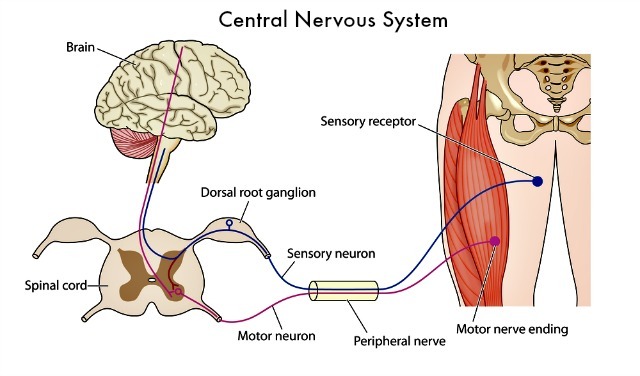 To understand these approaches it is necessary to describe the major components of the Central Nervous System that are involved in chronic pain. There are nerve cells called nociceptors that lie just outside and along the spinal cord in an area called the dorsal root ganglion (see the adjacent image). They are responsible for receiving pain signals via nerve fibers from their nerve endings which are spread all over the body’s surfaces (inside and out). The nociceptors then transmit the pain signal via a neurotransmitter (chemical messenger) to the neurons inside the spinal cord and on to the brain including the limbic area (emotions) and the conscious thought areas (pain avoidance). Obviously, the emotions generated are negative ones; hence, the depression and hopelessness that fibro people experience. The conscious thought areas begin planning to avoid additional pain which often leads to hyper alertness and avoidance of physical movement (i.e. exercise) that is so common with fibromyalgia. On the “Mind Body Science” page, I referred to what scientists called “nodes” or “hot spots” that lie along the main neural pathways. These are places where various types of nerve fibers, nerve cells, soft tissue, and neurochemical pathways all come together in very close association. Mutation or damage to nerve cells associated with these areas can result in chronic pain. The dorsal root ganglion is one such “hot spot”. In fact it is the first one, starting just below the brain stem. Now, let’s look at those nerve endings or the sensory receptor as it’s called in the adjacent image. The ones that relate to some of the research that’s the subject of this article are a set of nine sensory nerve endings called “sodium ion channels” which have been thoroughly studied for more than twenty years since they were first identified as pain sensors. In fact, you can thank that discovery for Novocaine, lidocaine, and other topical pain killers which work by entirely blocking these receptors. But, since most of these sensors are involved in all elements of the body including the heart and brain, such an approach is not safe except for very small areas. How to selectively choose specific ion channels has been the focus of much research that has only recently achieved enough success to interest pharmaceutical companies. This recent fibromyalgia research has focused on three particular ion channels involved with neuropathic pain because these are only associated with periphery pain. This allows researchers and drug companies to focus on ion channels that are not involved with the brain or heart for safety reasons. These three sensors come in several subtypes that are determined by their ability to detect very specific increments of voltage that when detected, cause the particular ion channel to open a pore. Whenever, a threat to our body is sensed, whether that be a force trauma (tissue damage), nerve damage, heat, cold, or a whole range of chemicals, these ion channels open a pore that allows sodium ions to enter through the cellular membrane of the nerve fiber. When this occurs, a small voltage potential is generated and passed on down the nerve fiber where other so called voltage-gated ion channels have the ability to sense the level of voltage. Each of these subtypes of ion channel has a built in threshold of voltage that when exceeded causes the channel to open and allow even more sodium ions to enter and therefore a greater voltage is produced and passed on to the next ion channel. Since thresholds are different for each of these channels, a virtual cascade of sodium ions can occur if the voltage potential grows large enough. The result of all this nerve ending activity is that a signal travels thru the nerve fiber to the nociceptors as stated earlier. Suppose a mutation caused all of the sensor molecules in an area of the body to be of a single subtype that opened to the smallest of voltage. Then millions of these ion channels would become “full on” to any small trauma rather than their normally graduated response depending on the level of trauma. Pain overload would result. This condition explains one of the three types of neuropathic pain, hypersensitivity to painful trauma. A second type of neuropathic pain, Allodynia, can now also be explained. The nerve fibers for touch and pain are separate but lie very close together. Their crosstalk is regulated by a component called an interneuron. This crosstalk normally never allows touch to feel painful, but does provide for a comforting touch to mildly reduce pain. However, it was recently found that when nerve cells are damaged, the central nervous system’s own immune cells cause a reduction of a critical carrier of chloride ions (KCC2) in the spinal cord neurons. This in turn causes a “short circuit” so to speak, in the interneurons which causes even a gentle touch to become the allodynia pain with which so many fibromyalgia victims are familiar. The advances in chronic pain research have been significant enough that drug companies are now involved and actively developing solutions that make use of all this recent knowledge. There are even clinical trials with humans underway. I’ll iterate just a few of the likely solutions. In the case of the “sodium ion channels” I explained earlier, you may remember quite a stir in the media and the fibromyalgia community back in 2012 about Small-fiber Polyneuropathy. Some even reported the cause of fibromyalgia was now known. This comes from a widespread lack of understanding of the symptoms of fibromyalgia. The media and the general public think fibromyalgia is only about pain. Of course we fibro people know better. Pain is, however, one of the worst symptoms; and that is what this article addresses. The “stir” was based on new understanding that came from one of the research studies I’m reporting here. And, the results of that study served to get a major drug company actively searching for ways to selectively control those ion channels. In 2013 this company discovered a chemical that affects the voltage mechanism of the most significant one of the three sodium ion channels. Several potential solutions are now being tested in patients. A second approach, at a major university, is focused on the same sodium ion channel’s voltage sensor. In a published report in June 2014, they reported that they are using an antibody from the immune system. The antibody relieves both neuropathic and inflammatory pain in mice. Finally, a report in November 2013 disclosed discovery of a drug that has great potential to alleviate the pain of allodynia. It improves the transport of the critical chloride ions in the neurons of the spinal cord that I discussed earlier. And, it eliminated the pain of allodynia in rats. We all know that it’s a long path to move a drug from animal testing to approval for use by doctors in humans. But, in the case of cancer, the FDA has approved some newer treatments for a “Fast Track” program. It couldn’t hurt for us to do all we can to spread awareness of the debilitating role of chronic pain in fibromyalgia. Maybe the FDA will hear us. At any rate, there is reason now to hope.